But the worst thing of all is how much time it takes me to make them. I don't know if it would be faster if I were better at it, I just know I can't do it quickly. I'm lucky if I can pull together a single page in a week, let alone several that I can split test against each other. Because of all that, my ears perked up when I heard about Premise. Ok, I was skeptical. Maybe because it so directly addressed my own personal shortcoming, but it sounded too good to be true. But there's a risk-free money back guarantee, and I have a good history with Copyblogger Media products, so I went ahead and ponied up. There are two price-points – $85 for unlimited domains, landing pages, and six months worth of graphics, copywriting advice, updates, seminars and support, and one-time $165 Ultimate for unlimited everything. Personally, I always go for the unlimited option, because I have my eggs in a lot of different baskets and I hate being constrained by licensing issues. Give me the all-you-can-eat buffet every time; one less thing to worry about. So I installed a test WordPress site, and then installed Premise – pretty straightforward; installs like every other WordPress plugin – and began to poke around. Simply put, Premise is a comprehensive tool set that walks you through turning your killer idea into killer landing pages. It's a WordPress plugin that doesn't bind you to your existing theme, or require you to do any programming to create custom posts or pages. You can create pages to match whatever WP theme you're using, or you can make something that looks completely different. It's a built in copywriting assistant. It's an SEO and conversion optimization tool. It's EASY. And it's FAST. To be honest, there's so much here, I can't get it all into one post – hence the part about the series. 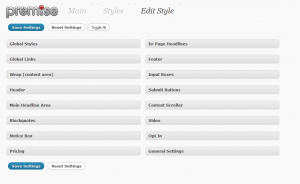 Everything is highly customizable – use the defaults, or build something on your own. Seven types of landing pages to build on – sales, content, pricing, opt-in, video, tab scroller, and a thank you page. HUGE graphics library – over 1100 buttons, badges, symbols, and more, all instantly available with a click. Use all your own copy, or get contextual sample copy to help you organize and optimize your offer for conversion. Create buttons with your own calls to action. The ability to save, import and export multiple design sets. Built in compatibility with Google Website Optimizer and Visual Website Optimizer – just add your ID. I'm pretty sure there's a lot more here that I just haven't found yet. Once installed, Premise places two additions to your left navigation; one for the landing pages you create, and one for the Premise settings. As I moved around in the Premise interface, I was particularly impressed with the attention paid to detail. Things like adding ‘Save' buttons at the top and bottom of screens. The ability to save multiple design sets. Setting up my first Pricing page, I was at first a little frustrated because my copy didn't seem to fit, and then I opened up the Copywriting Assistant and the first thing it told me in big bold letters was Keep It Simple, Sherlock. (I guess they didn't want to go with “Stupid,” ork ork) The advice was spot on. I have a tendency never to use one word where ten will suffice. The style design screen is so comprehensive it's almost overwhelming. There's a lot of options here, and it did take me a while to go through all of them to figure out what was where. I *strongly* advise that you toggle them all closed, and only open the ones you need for whichever landing style you're using, just to avoid the sensory overload. Once I got used to it, it didn't take me long to make a several design sets for completely different clients, that used the colors, backgrounds and logos from their existing sites. Then I moved to the Landing Page section to see what I could do there. Premise inserts a row of buttons that allows you to do things like insert sample copy (just to get you started), graphics, buttons, opt-in forms, notice boxes and other Premise goodies. And over to the right, you'll find contextual copywriting advice (it pops out so you don't have to lose your place). You have the ability to add header and footer scripts for whatever stats and analytics codes you want (gots to have my Crazy Egg) but I also installed Yoast's Google Analytics plugin, and the analytics code showed up just fine in the source. Another nifty option is that once you've created your page, you can immediately create a duplicate and then make whatever modifications you want for A/B testing. I'm a huge fan of all these little things that save me time. As a general rule, I keep my PPC landing pages out of the organic search results, but if you want to optimize for organics, much of the basic technical control you need is here. By the time I had spent a couple hours in it, I was awestruck at how much you get for the price. I've paid more than this just for (lesser) graphics libraries. If you need to produce landing pages – even if you are already producing landing pages – Premise will save you an enormous amount of time. And time is the one resource we never have enough of. I really don't like packaged all-in-one solutions that (unrealistically) promise the moon. If they ever work at all, it's only for about thirty seconds, and then things come crashing down. That's one reason I took to Premise immediately – this isn't a package like that. While Premise will help you create effective landing pages for many types of campaigns, it's not going to do all your work for you. If you want something that's going to pick a niche, give you a unique value proposition, select the best keywords, actually write the copy from scratch (instead of suggesting flow and best practices), and then convert like a mofo – don't bother, because this product is not for you. In order to make this work effectively, you have to know going in what your offer is going to be, and have a pretty good idea how you want to shape it. Premise will help you organize and present it effectively, (including some wonderful copywriting tips built right into design screen, and basic SEO tools if you need them) but it's no substitute for your brain or your skillz or your creativity. Nor will it solve all your AdWords Quality Score issues (most of the ones I see aren't even related to landing pages). Anyone who needs to create landing pages, at pretty much any level of expertise (or inexpertise) can learn to use this plugin pretty quickly. I created three sample pages in an afternoon (remember when I said up there ^^ that one would take me a week? ), none of which I would be ashamed to promote to production status. I can't show them to you because they're for my clients, but I intend to post up some samples off-niche soon. The ability to save multiple design sets makes it ideal for PPC managers, who can keep separate design sets for separate clients, or affiliate marketers who might be using multiple types of pages for different niches. And endusers can use it as well – there's enough good copywriting advice here to walk anyone through making an effective landing page – plus the promise of upcoming seminars! I specialize in e-commerce, but truth be told, not one of my clients is using a WordPress shopping cart. I'm mostly stuck dealing with OSCommerce, Zen Cart, Magento and some custom coded solutions. The problem there is that either the packages don't have a decent CMS capability, or I don't have the access I need to create landing pages on the actual site, or place tracking codes for Google Website Optimizer. So while I was playing with Premise, a light bulb suddenly went off over my head – why not put WordPress installs in folders or on subdomains, and use Premise that way? Of course, I'll still need to place conversion tracking on the final confirmation page of the shopping cart, but that's not usually as much of as issue as trying to get it on a product or category page. Note – tracking subdomains will require some change to sitewide Google Analytics code, as outlined here. A folder might be a better option if you can swing it. So now I can make landing pages exactly the way I want, regardless of CMS or cart, with a style to match the site – only I can pick and choose which elements I want to have on the page. Woot! I also have clients that serve widely different niches, and this allows me to quickly create a lot of very niche-specific pages; when your customers run the gamut from churches to car washes to casinos, you either have to come up with a page that suits all purposes (close to impossible) or spend a lot of time making a lot of different pages. Where's the Support link? I spent a lot of time when I first installed it just clicking on things to see what they'd do. It'd be nice if there were a way to get help or support right from within WordPress. Most of the page types are pretty intuitive, but setting up my first Pricing page, I had some confusion over what goes where (not everything is labeled). If there's real documentation somewhere, I haven't found it. On the Premise website, you can find a breakdown of all the options, but it's listed (oddly I think) on the Features page. (Oh, and the traveling left sidebar menu on that page – GAAAH! those give me seizures) Since I know Copyblogger Media is big on support, I'm sure it's either there or in the works, but I need it pointed out. I don't exactly know how they'd implement it, but the ability to do multivariate testing would be way cool. I'm spoiled by Raven Tools; on every page of their site there's a little button you can push to send them a bug report or a feature request. Not practical for every page of a WordPress plugin, but having even one such a button available for Premise would be helpful. I'm hoping they expand the email options; I have clients using other companies to manage their campaigns. Next time I post on this, I should have some data on conversions; in two cases I am testing Premise pages vs what I was using before. Premise looks like a decent solution for those guys that don't know how to create an LP on their own, but so long as you know what content you're ready to put on it, you can pick up an HTML/CSS LP for less than a couple hundred bucks. I think that's a lot better than relying on a bulky WP template/back-end even if you have to charge your clients a tid-bit more to get it done. In the end they'll be thanking you when they start making more money off it. Well, I've looked at (and even purchased) some of those templates, and haven't been too impressed with them. As far as value for the money, Premise just plain offers a lot more. I didn't find it to be bulky (although admittedly I haven't gone through every single type of landing page yet) I certainly wouldn't be ready to claim that a template would make more conversions, at this point. Does Premise automatically remove the header and sidebar formatting on new landing pages you create, or is that something I have to mess with in the format of my blog (which is a terrifying proposition as i have a custom wp thesis blog)? I'd like to give a go and uploading this and setting it up (I've never even installed a Plug in before)… so the easier the better! I would *hope* it would work fine with Thesis; I'm using Genesis on everything now, and it's flawless with that.